The first quarter of 2017 is in the books, so it's time to review the performance of our global ETF portfolios. The quarter kicked off with the inauguration of President Trump and ended with the Trump Administration's failure to win passage of a bill to repeal and replace Obamacare in the House of Representatives dominated by his Republican Party. Against this background, a Canadian stay-at-home investor who invested 60% of her funds in a Canadian stock ETF (XIU), 30% in a Canadian bond ETF (XBB), and 10% in a Canadian real return bond ETF (XRB) had a 1Q17 total return (including reinvested dividend and interest payments) of 1.7% in Canadian dollars. Had that investor diversified her portfolio to the global ETFs that are tracked in this blog, her returns would have been as much as twice that high. The weaker performance of the all-Canadian portfolio continues a trend that began with the election of Donald Trump as US President. 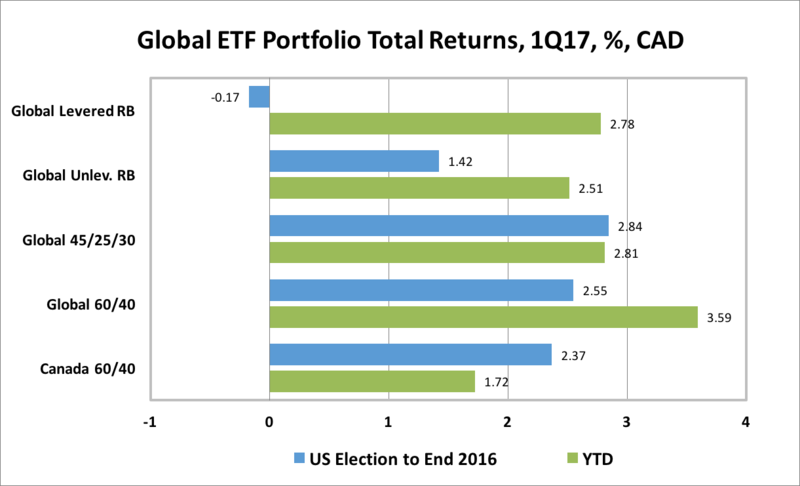 However, the leading global ETF performers evolved in interesting ways in 1Q17 that reflected, in part, the markets' changing assessment of Trump's ability to implement his election promises. The chart below shows 1Q17 returns, including reinvested dividends, in Canadian dollars (CAD), for the ETFs tracked in this blog. The returns are shown for the period from the US election in November through the end of 2016 (blue bars) and for 1Q17 (green bars). As the CAD appreciated 1.1% against USD, two of the best global ETF performers were Emerging Market equities (EEM) and Gold (GLD), each of which suffered big losses in the immediate aftermath of Trump's win. 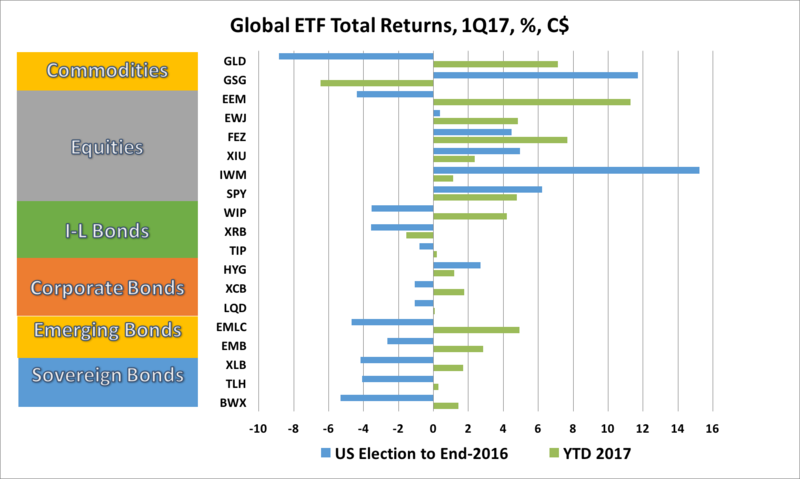 The worst performer in 1Q17 was the Commodities ETF, which had posted sharp gains immediately following the election. Global ETF returns were mostly positive across the different asset classes in 1Q17. In CAD terms, 17 of 19 ETFs posted gains, while just 2 posted losses. The best gains were in the the Emerging Market Equity ETF (EEM) which returned a strong 11.3%. The Eurozone Equity ETF (FEZ) was second best, returning 7.7% in CAD terms, followed by the Gold ETF (GLD), which returned 7.1% in CAD. Other solid gainers included the S&P500 ETF (SPY), the Japan Equity ETF (EWJ), and Emerging Market Local Currency Bonds. The worst performers were the Commodities ETF (GSG) which returned -6.5% and the Canadian Real Return Bond ETF (XRB) which returned -1.6%. In 1Q17, the global ETF portfolios tracked in this blog posted solid returns in CAD terms. However, as with the performance of individual ETFs noted above, the performance of of the various portfolios evolved significantly in 1Q17 versus that of the immediate post election period, as shown in the chart below. A simple Canada only 60% equity/40% Bond Portfolio returned 1.7%, as mentioned at the top of this post. While solid, the 1Q17 return was weaker than the all-Canada portfolio achieved in the period immediately following the US election and also weaker than the returns on the global ETF portfolios. Among the global ETF portfolios that we track, the Global 60% Equity/40% Bond ETF Portfolio (including both Canadian and global equity and bond ETFs) returned 3.6% in CAD terms, continuing its strong performance in late 2016 and making it the best performing portfolio since the election. A less volatile portfolio for cautious investors, the Global 45/25/30, comprised of 45% global equities, 25% government and corporate bonds and 30% cash, returned 2.8% in 1Q17, about the same gain it enjoyed in the immediate post election period. A Global Levered Risk Balanced (RB) Portfolio, which uses leverage to balance the expected risk contribution from the Global Market ETFs, gained 2.8% in CAD terms. This was a remarkable improvement over the return of -0.17% in the immediate post election period, as bonds and foreign currencies performed significantly better in 1Q17. An Unlevered Global Risk Balanced (RB) Portfolio, which has less exposure to government bonds, inflation-linked bonds and commodities but more exposure to corporate credit, returned 2.5%, also a significant improvement over the immediate post election period. In my view, the main events that left a mark on Canadian portfolio returns in 1Q17 were President Trump's setbacks and delays in implementing his election promises; the decision by the US Fed hike its policy rate more quickly than markets had expected; and stronger-than-expected growth of DM economies outside the US. Trump's setback on Obamacare, as well as the successful court challenges to his executive order temporarily banning immigration from certain countries, demonstrated both legislative and judicial obstacles to implementation of some of his election promises. Markets had cheered his promises to reduce regulation and cut taxes. He has made headway on cutting regulation but the setback on Obamacare has raised doubts about his ability to get controversial elements of tax reform through Congress. In addition, Trump has not yet followed through on his protectionist election promises targeting Mexico and China which had hammered Emerging Market stocks and currencies in the immediate aftermath of the election. The Fed's decision to hike in March dampened bond prices, especially for longer term bonds. Meanwhile, stronger-than expected growth in the Eurozone, Japan and Canada helped boost equity returns outside the US. At the beginning of 2017, I said that the most interesting question, in my mind, was whether the all-Canada 60/40 ETF portfolio would outperform the unhedged global ETF portfolios as it did in 2016. The answer, so far, is that since the election of Donald Trump the all-Canadian portfolio has returned to the pattern of the past five years, in which it lagged the performance of the global ETFs portfolios by a wide margin. Three months ago, I said that answer to the question would be determined in part by the behaviour of commodity prices, the Bank of Canada and the Canadian dollar. Commodity prices which were expected to firm modestly, have fallen. The Bank of Canada has so far remained in no hurry to begin raising its' policy rate, even as the Fed hiked in March, sooner than expected. Despite weakness in commodity prices and a dovish BoC, the Canadian dollar, which was expected to weaken moderately against the USD, actually appreciated by over 1%. Upward revisions to expectations for Canadian GDP growth along with President Trump's limited success, so far, in implementing his policy promises has weighed on US dollar sentiment and helped lift the Canadian dollar. If Trump's plans continue to be thwarted or watered down by Congress, the trends of 1Q17 may be expected to continue. Emerging market equities, bonds, and currencies, which sold off in the immediate post-election period on fears of Trump's promises of protectionist policies, have further room to rally. The main risk to that outlook is that President Trump, stung by his early setbacks, redoubles his efforts on protectionist trade policies and tax reform, including some form of border tax.